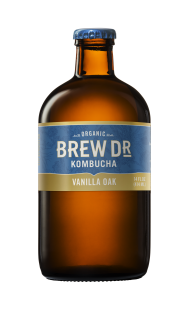 PORTLAND, Ore. — Back by popular demand, Brew Dr. Kombucha’s winter seasonal, Vanilla Oak, is now available nationwide and in Canada. The limited-edition flavor features a crisp combination of fresh-scraped organic vanilla bean and oak steeped in a kettle with black tea. Vanilla Oak will be available in 14-ounce and 32-ounce glass bottles from mid-October through March 2019.